Lightweight and Durability and suitable for all types of shade applications. Usually used as car roof covers and house roof for heat insulation. It is mainly used for the places that has higher requirements for shading effects. You will feel much cooler with it . And it will have no affect for photosynthesis ,then your fruit and flower will grow up healthy. And when the sun or snow is too strong, the plants are not easy to dry up or frozen. Besides,it's environmental protection and non toxic material ,so the birds or animals won't get harm . Material : Adopt high-density polyethylene material, Shading on 85% rate and heavy duty. Easy to use : All 4 sides taped by double stitched with one metal grommet,you can easy to use. 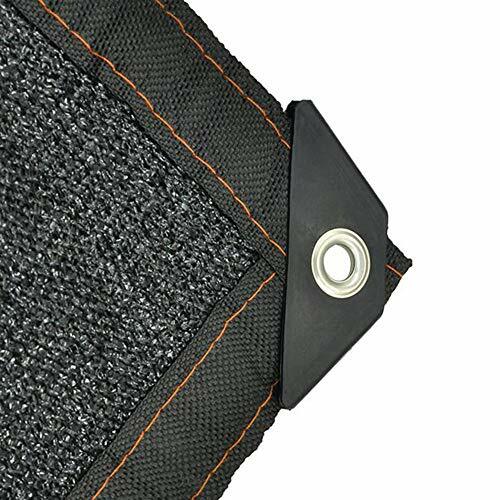 Unique details:The updated version sunblock shade net replaces the original plastic edge with a nylon cloth edge and uses a reinforced edge to make the shade net more durable. It will have no affect for photosynthesis and is more suitable for blocking the sunlight and heat while air can still flow through. Application : Have a general propose for the outdoor sunblock ,such as greenhouses,plant ,flowers, fruits cover, block the sun, with heat, moisture, frost-proof, cooling,Perfect for plant cover, summer shading cover,etc. If you have any questions about this product by Tarps, contact us by completing and submitting the form below. If you are looking for a specif part number, please include it with your message.